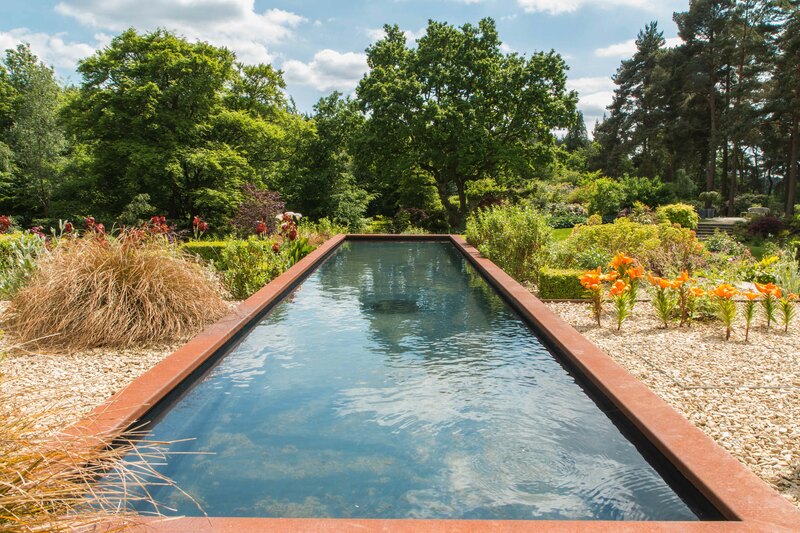 We carried out the landscape design and build for this Farnham garden. This included the removal of an existing swimming pool and re-contouring the large garden utilising all the soil on site, with no waste away. We used the spatial ‘problems’ of this steep garden to our advantage to make an ‘amphitheatre’ effect of planting when seated on the lower terrace. The team manipulated the existing ground contours to create an interesting series of spaces that would integrate into the existing garden while providing a distinct ‘wow’ element. Complementary materials were vital, and sawn sandstone was used to contrast with the rusting steel work. The flights of steps are all illuminated with stainless steel louvered lights to create a fabulous effect in the evening as you move through the planting. We replaced existing small stone walls using Corten steel for the retaining walls to reduce the amount of excavation and provide crisp edges to the lawns and borders. A terraced gravel garden was created along with a rectangular Corten clad reflective water feature that runs parallel to the house extension/roof garden. As with all of its projects, PC Landscapes encourages clients to hire the company at the earliest stages of a project so they can utilise all our skills. Our gardens integrate all the features you would expect a modern home to have, from water harvesting and irrigation systems, to detailed lighting for dramatic planting schemes.